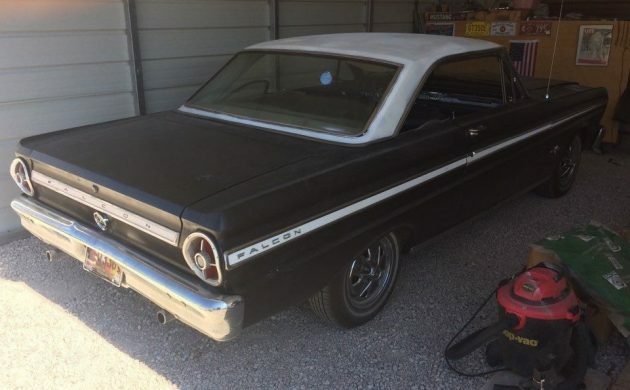 When the Falcon, Corvair, and Valiant were introduced as new compacts in 1960, it was the Falcon that became the best seller of the three due to its wider appeal. The Corvair took more of the sports market instead while the Valiant apparently appealed to Chrysler fans. 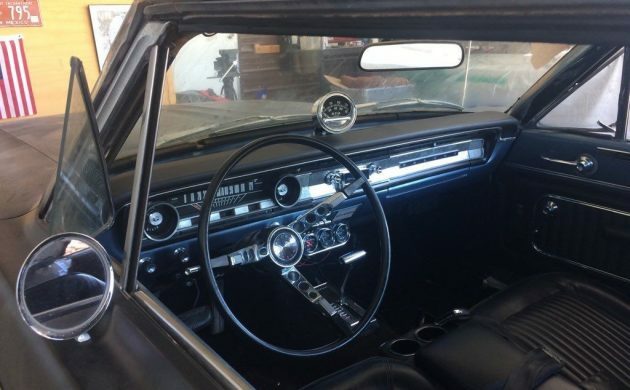 We all know that in 1964 when the Mustang was introduced, it used a lot of its underpinnings and parts from the Falcon, but Falcon wanted in on the sporty game too. Therefore, the Sprint option was offered, actually before the Mustang ever came along. The option originally included a 289 cubic inch V-8 engine, bucket front seats and badging. 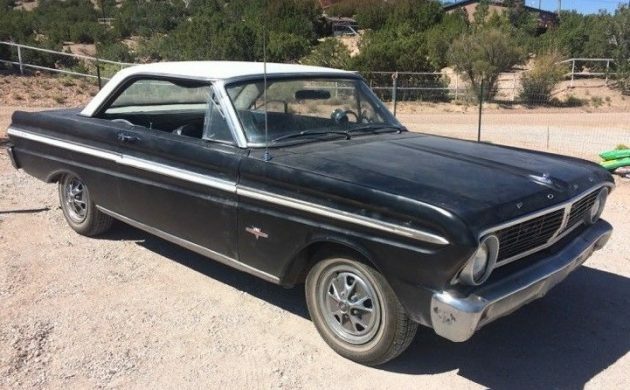 Here is a 1965 Ford Falcon Futura Sprint 2 door hardtop for sale here on eBay in Placitas, New Mexico. It is listed at a Buy it Now price of $4,900. Unfortunately, due to a medical emergency, this is the last of a car collection to go for the seller which was his wife’s favorite car in the collection. It is a solid car from California and then to New Mexico and is one of 2,806 Futura Sprint hardtops sold in 1965. A friend of the seller’s father started a restoration 15-20 years ago. At that time, work was done on the interior, engine, transmission, paint, trim, vinyl top removed, and minor body repairs. A nice job has been done on the interior, even though the seats and center armrest are modernized rather than the original pattern. The back seat is going to need some work because it currently appears to be held together with duct tape due to the sun baking the top of the seat. The engine is an eighties Mustang 5.0, rather than the original 289 V-8. It has Edelbrock intake manifold and 4-speed overdrive transmission. There are a lot of new engine related parts and the car starts and runs great. You can drive the car as is or if interested in a further restoration, there are several things that will need to be updated including headliner, rear seat, cracked and dried rubber around the windshield and rear window, and door rubber. Anybody can own a Mustang, but here is something a little more unique if you like something that stands out from the crowd. The seller wants no low ball offers but is willing to negotiate. It seemed to be reasonably priced, that’s why it’s gone. Yeah, that went fast! I’ve always really liked the Falcons, especially with a V8. I’d much rather have the original 289 though. Looks clean. Someone got a good deal. When they’re priced right the real buyers will find ’em. What a great color combo of black, Sprint interior and subtle upgrades. Love the Mustang road wheels too…can’t remember if these came as an option on the Falcon. Nevertheless, reminds me of a red one on my newspaper route in the early 70s. One sharp package. yep 5K $ for the ‘stang father, originator of the muscle car & USA’s attempt to challenge the Bug (1960) as it decimated our auto industry. “Falcon’s” also originated the SUV mrkt as the ’66 – ’77 bronk is just a 4WD falcon. So three roots began here: muscle, econo, & suv. Great piece of world history. Excelent DD (esp in a waggy). Bill, if may make a correction here. 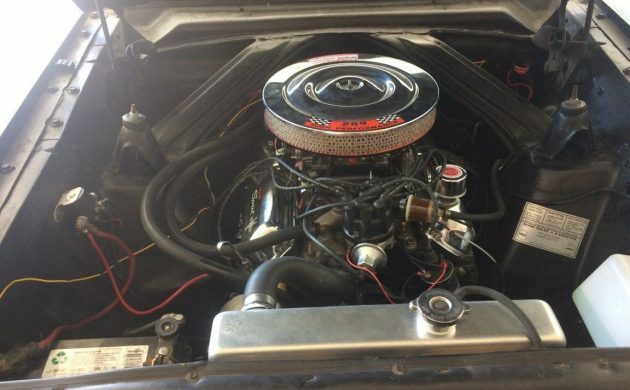 When the Sprint first came out in 63, the v8 option was the 260 Challenger v8. The 289 wasn’t available for Falcons until this year.